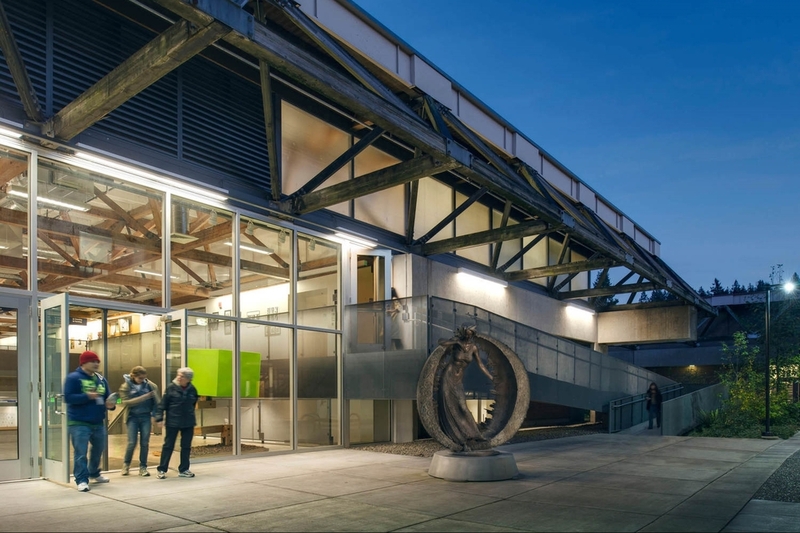 This $8.2 million dollar adaptive re-use of an existing warehouse structure was previously designed for LCC’s aviation program. The new uses include the Art School, RTEC program, Recycling Center, and the Specialized Support Services program. The project involved the renovation of three buildings. 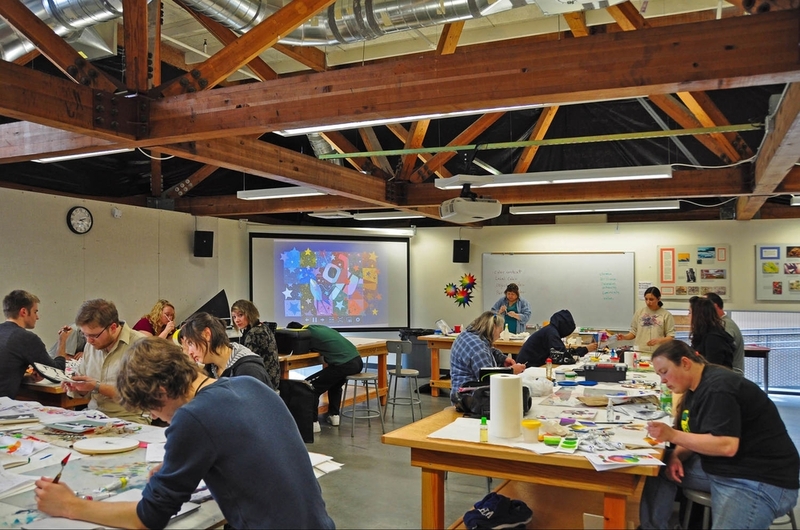 A former 28,000 sf aviation technology hangar was converted to a 50,000 sf space housing studios, classrooms and offices for the Art and RTEC programs on two levels. A covered breezeway was converted to a 10,000 sf shop for the recycling program. 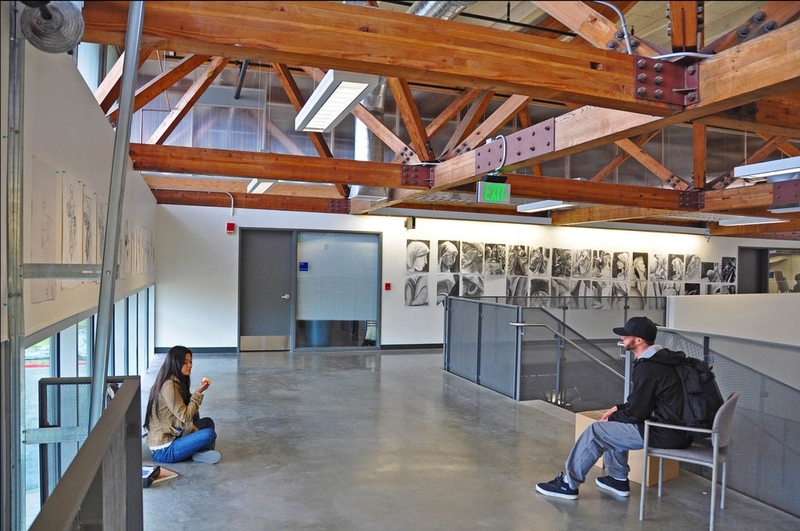 In addition 20,000sf of interior space in an adjacent existing building was remodeled to house the remainder of the Art program and the specialized Support Services program. The tight budget required limited, but strategic design decisions. Elements such as the steel stairs, railings, and ramps supply the finer grained human scaled detail to the renovation. The character is explicitly industrial and in a few places expresses a whimsy and toughness found in the best buildings devoted to teaching visual arts and creative technology programs. Start with a 1970s 120’ x 240’ x 20’ tall airplane hangar roofed with an 8’ deep clear span timber space frame. Infill with seemingly unrelated academic programs, and do it on $125/sf. No cheating. 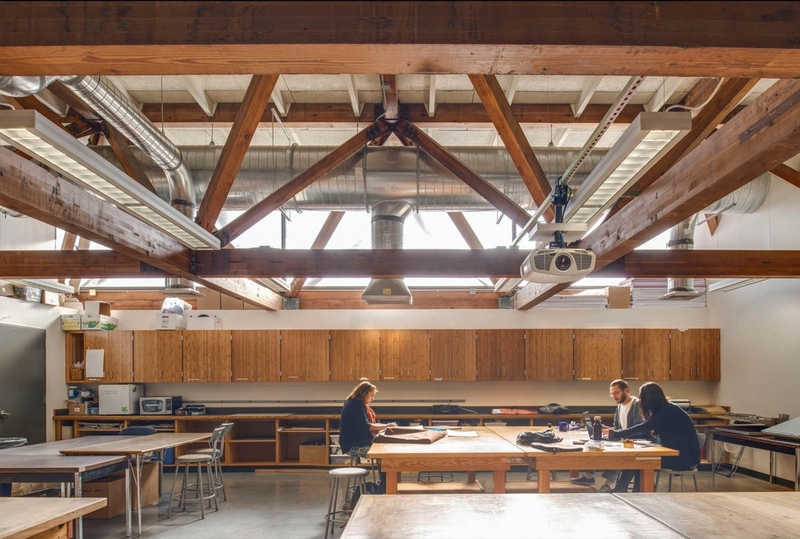 This problem was untangled through extensive design negotiation, discovering common ground, and applying a few simple organizationalmoves to form a framework for the building to begin a new life as an art school, a technology center and a recycling center. The parti is simple: two long solid bars, separated by a central open bar. Two floors of studios and classrooms form the long edges. 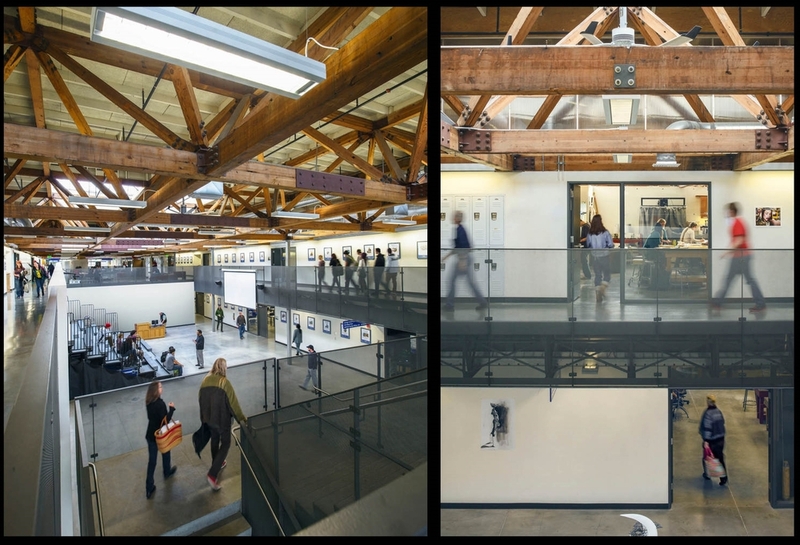 The central bay gathers the daylight, accommodates all circulation, forms the gallery and exhibition spaces, and hides support spaces under a 2nd floor shared study loft that unites the programs. The rigorous geometry of the space frame required disciplined layout of walls in plan, while the low height of the frame required precise insertion of the second floor in section. At strategic locations, human-scale elements supply a finer grain of detail and departure from the grid. The character is explicitly industrial and expresses whimsy and toughness while allowing the space to be a canvas for change.